Learning French as an adult can be quite challenging. Between work, family, social life, and all the numerous adulthood responsibilities that you juggle every day, it’s difficult to find a way to insert learning a language into your already crammed schedule. Okay, I hear you. 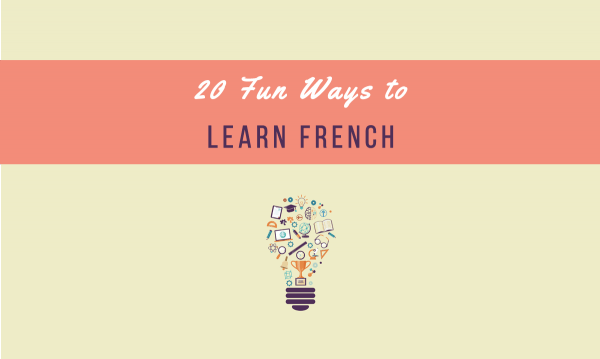 Which is why today, we’ll be taking a look at 20 different fun ways for you to incorporate learning French into your day---and immerse yourself in the French language and culture---regardless of how busy you are. Is it possible? With your ultra-busy schedule and all? We will see. Let’s go over the list now and you be the judge which ones are totally doable. Quick Navigation: What's in this article? 1. Start your day with French news. 2. Listen to French music while running. 3. Go over your French vocabulary while you shower. 4. While preparing breakfast, say each ingredient in French. 5. Read a French blog during breakfast. 6. Listen to a French podcast during your commute. 7. During coffee break, try some apps on your phone like Duolingo, Memrise or Anki. 8. Listen to a French audio book during lunch break. 9. ...or watch one episode of a French TV show. 10. ...or watch French videos in Youtube, Yabla, Apprendre tv5 monde. 11. Learn a new French word during your afternoon break. 12. Reach out to French-speaking friends. 14. Practice “thinking in French” for a few minutes. 15. In the evening, relax and watch a French movie. 16. Listen to French music as you prepare dinner. 17. After dinner, settle down with late night television… in French. 18. Read a French book before bedtime. 19. ...or a French comic book. 20. ...or you can continue with your French audio book instead. ​It’s a common habit to read up on what’s happening with the world right after you wake up in the morning. If you’re already doing this daily, it’s simply a matter of switching to French online newspapers instead of the ones in your native language. Or perhaps you can change the language of the international news site to French? Reading news in French would not only help you practice your reading skills, it will also keep you abreast of the biggest headlines that day, in France and in the world. Plus, of course, you can use what you’ve read as discussion points when practising with French speakers later on. Start with the ones you see in the bathroom, such as the following. Time to prepare breakfast! While whisking some eggs, chopping up some fruits or pouring cereal into your bowl, try practising how to say the different French words for each ingredient. As you progress with your french, why not take it a step further and pretend like you’re in a French cooking show? Time to eat! While sipping on your coffee or munching on that croissant, there are plenty of good French blogs you can check out, starting with this one of course. Talk in French has plenty of articles that you can go over for a few minutes each morning. The lessons can be sorted out depending on your level. You can find vocabulary lists, grammar lessons, culture topics, and more. Aside from Talk in French, you can also find a long list of recommended websites here. Ugh, commute time. Hardly nobody ever looks forward to commuting in the morning. But the precious minutes---or even hours---of your commute can be better spent while listening to a podcast. Give it a try, if you haven’t yet. Whether you drive for work or you take the public transport, the Talk in French podcast can keep you company. There are episodes in English, for beginners, and just recently, I have released new episodes for advanced level. Time for a quick break! You’re halfway through a long morning’s work and desperately need a caffeine fix. While sipping your coffee, you can make your break even more productive by trying out some fun games. Not only will it keep your mind off work for a few minutes, you’ll have fun while learning French, too. You can try some of the apps below. Duolingo is a fun and free website that combines gaming and technology to create a fun learning method. With every short lesson, you can improve your listening, speaking and do translation exercises. Memrise and Anki make use of spaced repetition system (SRS) to help you memorize vocabulary. All three apps can be easily downloaded on your phone and can be used for those few moments of respite from work. Ahhh lunch break. Time to stretch those legs and walk around for a bit. An entire morning cooped up indoors is no fun, so if you fancy a quick stroll outside the office, make sure to bring your earphones so you could listen to a French audio book. Talk in French has some books available on Audible. And the best part is, if you sign up to Audible, you will be able to get your first audiobook for free. But if TV shows aren’t really your thing, cheer up, there are plenty of other options. The internet is a treasure trove of fantastic resources including lots of videos that you can watch during any spare time. Youtube, of course, leads the pack. You can find all sorts of tutorial there about learning French, starting with our very own Talk in French Youtube channel. Other options include Yabla which is an immersion site that offers interactive videos, and Apprendre TV5 Monde, a site that offers videos with quizzes and transcripts. Whoa, time flies. You were too absorbed in those reports that you didn’t notice it’s already time for a quick cup of coffee! Just like this morning’s break, you can also make it a little bit more productive by inserting one small thing into your routine. Take out your phone, go to the Talk in French social media accounts and check out the word for the day. In the Talk in French Facebook page, you can find a list of vocabulary words shared every Monday. Same with the Pinterest page. If Twitter or Instagram is more your thing, you can also go check out Talk in French there (account name @talkinfrench) and get your daily French word or expression. Anytime during the day that you have time to spare, try to reach out to your French-speaking friends. This can be through a simple text message (or Viber/Whatsapp message), a social media message, a super short email, or even a phone call. No matter which way you reach out to them, just make sure you will do so in French. Let them know beforehand that you will only be communicating in French so that they won’t make any attempts to steer the conversation to English. Interpals is a good site to look for someone to practice French with. Italki is a social network and educational website for language learners. Lang8 is another online platform that you can use to connect with native speakers. This is the place to you go if you want to get your texts corrected. Once you find some French speakers in those sites, try and practice your French by reaching out to them during your downtime throughout the day. ​Whenever you can spare some time, train that voice in your head to think in French for a few moments. Give it a few tries. Trust me, it’s not so hard when you can already form basic sentences in French. A whole day at work is done. Whew. You arrive home uneventfully and wish nothing more than to relax. At this point, you can prop up your feet on the couch and put on a movie. Whether you’re on your own, with your family, or having a “Netflix and chill” with someone special, there is a French movie that is perfect for the occasion. Check out the movie lists here in Talk in French. There are child-friendly films for the entire family, romantic films, adventure films, and loads of other fun stuff to choose from. If you’re feeling a little adventurous, you can also select the film by day. You see, Talk in French provides a list of daily movies for you to watch. For example, for the month of April, you can head over to the April movie list and scroll down to see the day. For more movie recommendations plus a complete guide on how you can use movies to learn French, go here. Pop open a bottle of wine and get into the groove as you cook. Time to prepare dinner! Bust out the speakers and have a rocking good time while you cook! Check out that playlist of more than 600 songs you can listen to using Spotify. You can sing along to the lyrics, too! vIt’s late in the evening and you pat yourself in the back for a long and productive day. Time to relax with some late night TV! Should you go for Jimmy Fallon? James Corden? Conan O’Brien? Or are you more the Kimmel fan? WAIT---How about something different like late night French television instead? Try Le Petit Journal. It’s one of the most popular shows in French. And the best part is, it’s available in countries outside of France, unlike other French shows! It’s quite late now and time for bed. To wrap up the day nicely, you could read a few pages of a book….yep, a French book. There are plenty of good French books that you can consume based on your level. Here is a good list of novels you can check. If you want tips on how to read in French like a boss, you can get it here, too. Better yet, check out these French short stories e-books. Perfect for a short read before bedtime! Would you rather read comic books instead? No worries, we got you covered. Here is a list of some of the most popular French comic books. But of course, if your eyes are too tired and you’d rather be lulled to sleep, turn on the French audio book instead and close your eyes as soothing French voices carry you over to dreamland. So… now that you’ve seen the list, which ones do you think are easy enough to insert in your schedule? Sound off in the comments! Feel free to add your own suggestions, too. For more tips on how to effectively study French, grab a copy of FLUENT IN FRENCH by clicking the photo below. 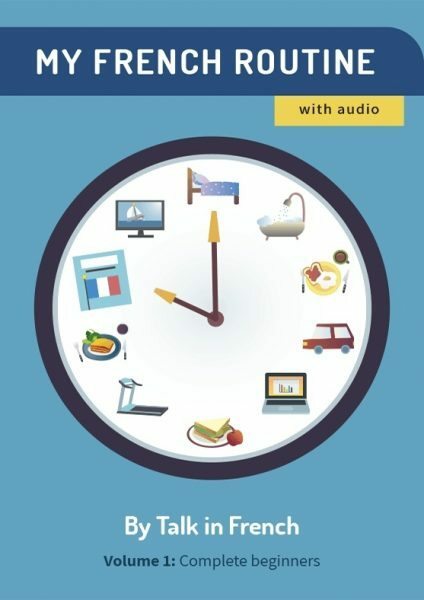 Previous Post 30 French Words that Learners Have Trouble Pronouncing Next Post The 5th Volume of My French Routine Learning Series — Out Now!